The month of January has not been friendly to the Colorado Avalanche. Things continued to get worse Wednesday night as the Avs fell 5-2 to the Minnesota Wild. The loss pushes the Avs losing skid to two-straight games as they head into the NHL All-Star Break this weekend. Nathan MacKinnon, Mikko Rantanen and Gabriel Landeskog will be representing the Avs in this weekend’s All-Star festivities that begins on Friday, Jan. 25 and concludes on Saturday, Jan. 26. At a point of their season where the top line has been having troubles finding the back of the net, one bright spot for the Avs offense has been veteran forward Carl Soderberg. He tallied his 17th goal of the season, a career-high, for the first goal of the game for the Avalanche. Despite the Avs being able to tally the first goal of the game, the lead was short-lived as Wild forward tallied his first goal of the game. The first period continued to be a back-and-forth. 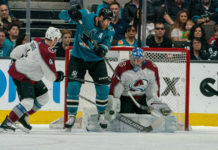 Finally, the Avs’ top line got on the scoresheet when Tyson Barrie fired a low wrist shot from the point to beat Wild goaltender Devyn Dubnyk to give the Avs the 2-1 advantage. Minnesota defensemen Jared Spurgeon eventually tallied a goal of his own as the two teams headed into the middle frame tied 2-2. Following a strong first period, the Wild took over the remainder of the game as Staal notched his second goal of the game on a power-play. Later, forward Charlie Coyle notched a goal to give the Wild the 4-2 lead heading into the third period. 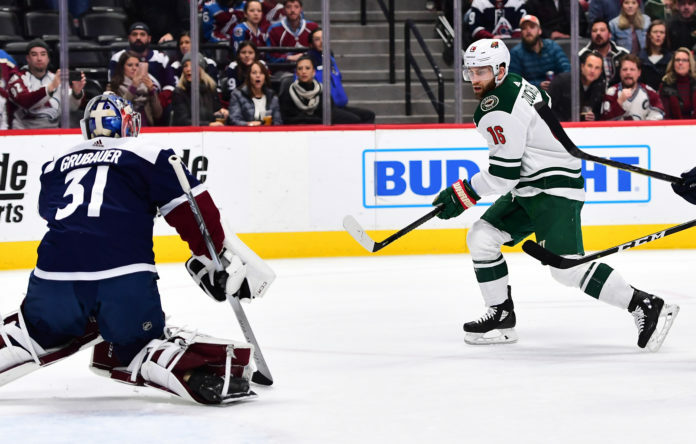 Special teams was a large difference-maker in this game, as the Wild finished 2-for-6, while the Avs finished the game going 1-for-2 in the game. Nothing changed in the third period, as Wild defenseman Ryan Suter tallied a powerplay goal to put the game out of reach, and allow the Wild to come away with the 5-2 victory over the Avs. 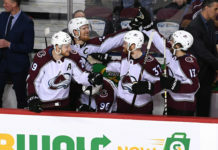 Following the All-Star break, the Avalanche will have 32 games remaining and they will get back to work when they host the Vancouver Canucks on Saturday, Feb. 2 at Pepsi Center.